A-20G-25-DO Havoc Serial Number 43-9392 Tail ? Assigned to the 5th Air Force, 312th Bombardment Group, 386th Bombardment Squadron during February 1944. No known nose art or nickname, possibly "Hot Box". Tail letter unknown, possibly G.
When lost, this A-20 had engines R-2600-23 serial numbers left 43-103693 and right 43-103710. Nose machine gun serial numbers: 675748. 946658. 675789, 676028, 947010, 114975. Top Turret machine gun serial numbers 114977 and 563450. On August 11, 1944 took off from Hollandia Airfield at roughly 7:30am on a mission against Utarom. 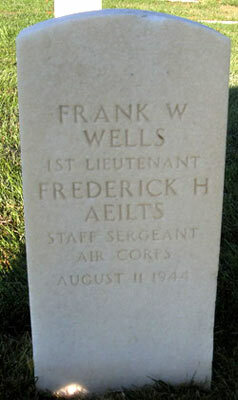 Wells was leading twenty-four A-20 Havocs from the 387th Bombardment Squadron and 388th Bombardment Squadron. Over the target, the A-20s bombed, strafed barges and three dropped leaflet around Cape Bitsjaroe, southwest of Utarom. The organization of the mission broke down and A-20s attacked targets individually. After the mission, other crews recalled hearing distress calls from Wells and that he was "going down", another pilot observed this A-20 a half mile away being targeted by anti-aircraft fire, likely from nearby Kaimana Airfield (Utarom). Presumed to have been shot down or ditched into the sea off the target. Last observed by fellow pilots Hogan and Folmar to the west of Kaimana Bay. Postwar, the remains of the crew were recovered, details unknown. Both were transported to back to the United States for final burial. The entire crew was officially declared dead the day of the mission. Both crew are memorialized on the tablets of the missing at Manila American Cemetery. After the recovery of remains, both crew were buried in a group burial at Jefferson Barracks National Cemetery in a collective grave at section 82, site 83c.